I finished this quilt just in time to give it a good test drive during a short camping trip to Jasper National Park last week! It’s so much fun having a quilt to photograph when you’re camping! This particular project was a “Shop your Stash” challenge quilt hosted by the Good Time Quilters, one of the guilds I belong to. We paid for the pattern, sight unseen last fall, then had the rest of the year to make something using the pattern as inspiration. The only caveat? You had to shop your stash. And did I ever! The pattern is Garden Party by Blackbird Designs. It’s a combination of piecing and applique, with little 3-D flower centers. The backing is made up of miscellaneous bits and pieces of green & brown fabrics. What I’d call my ugly fabrics. Mr. C. actually likes the back better than the front. I guess there’s no accounting for taste, lol. It’s quilted free-motion style on my little Janome 2030 in what’s called the stipple pattern . Folks, this was my very first attempt ever (ever!) doing free-motion quilting, and I’m pretty darned proud of myself. I didn’t quilt inside the flowers…as a result, they’ve puffed up a bit. I like the effect. And you know what? It’s 100% made from my stash. I didn’t buy a single new thing to make this quilt. 🙂 This makes my thrifty heart do a happy dance! Little Sister: A Quilt Finish! This entry was posted in applique, Blog Categories, Camping, Quilting, Quilts, Travel, Vacation and tagged camping, garden party quilt, good time quilters, jasper national park, quilt, shop your stash challenge quilt, snaring river. Bookmark the permalink. Stunning. No other word for it. Your quilting looks like it was done by a seasoned quilter. Photos are outstanding too. The Yukon is a beautiful place. Congrats on a finish for the cabin. A stash busting quilt IS the best feeling I have to agree!!! !I’m getting in the mood myself to shop my stash and do something creative. THANKS for the inspiration….as yous is fantastic…seriously…on both sides! Congratulations on a beautiful finish and you certainly have some wonderful backdrops for it! Gorgeous!! What a great quilt, both sides! I guess Mr. C is a modern quilt lover. 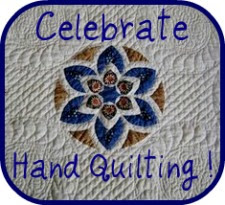 =) I’m s proud of your FMQ, too! You did a good job shopping, inspiring, and quilting!!! I love it! What a piece of art…. And what a setting! That blue, blue sky and the soaring mountains– an incomparable background!